Updated 05/04/2018: Made standalone version of the mouth as skin detail, now that Maxis has enabled skin details for aliens. Thanks to Handman50 for the suggestion! This version has no eye texture and will work with any eyes, human, alien or vampire. Updated 14/02/2017: Removed teeth so it doesn't override new Maxis tooth customisation textures; made compatible with toddlers. 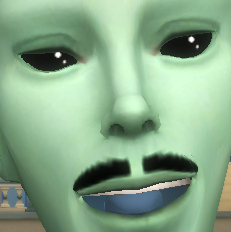 I've been having lots of fun with my TS2-style aliens since I made those skins , but two things have been bothering me about them - their pink mouths and their hideous eyes! Aliens in The Sims 2 had blue gums, and it made them look that extra bit alien. And the TS4 eyes have this terrible, foggy attempt at shine - so I decided to kill two birds with one stone and make some TS2-style alien eyes with gums attached to complete the look! Make those sad aliens happy again! I feel they have so much more personality with these more cartoony eyes. The difference in the mouth is a subtle one, but it is noticeable -the mouth is totally recoloured, and the interior is a slightly darker shade than the tongue and gums (unlike EA's textures for TS4). The mouth will switch to blue automatically as soon as you select the eyes. Getting rid of the shine was easier than I assumed it would be, and now TS4 is a little bit closer to TS2! You'll find the eyes last in the list, after violet, and they'll have a deep black thumbnail. 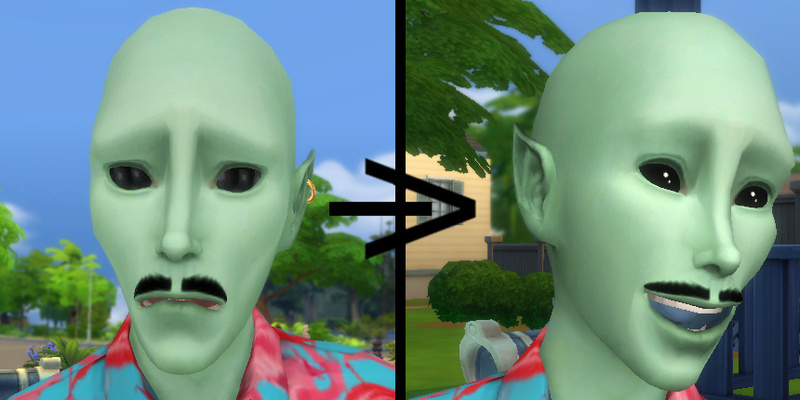 They're available both for humans and for aliens, and don't replace anything else - they're also set to not spawn on random townies. You can use this as a base if you'd like to make eyes that don't have a specular, or if you'd like to make your own recolour of the TS4 mouth! It's even improved poor Stella's lovelife! 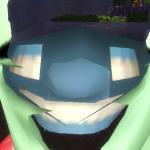 Qahne offers no guarantees as to the effect these eyes will have on your romantic endeavours. Any claim made here is anecdotal and has not been scientifically verified.